CINCINNATI -- The grand opening of Taft's Brewing Co.'s new 50,000-square-foot location on Saturday is going to be a literal circus. "It's going to be crazy," said Dave Kassling, one of the managing partners of Taft's Brewing. "The grand opener is going to be so much fun. We're going to have circus performers, four bands headed by the Rumpke Mountain Boys, DJs in between, and the first 500 people to show up will get a golden ticket with a special prize in it." Kassling and business partner David Williams call the taproom in the front of the facility, located at 4831 Spring Grove Ave., the "Brewpourium." The back portion of the building makes up Taft's new state-of-the-art production and distribution facility. Sixteen Taft beers made onsite will be on tap during the grand opening, which will run from 1 p.m. to midnight Saturday. "This is our production facility, so we are doing canning and kegging," Kassling said. "You get a real industrial feel here. You can eat great pizza and enjoy our beers here in the front of the building." People can order and watch as their coal-fire cooked, New Haven-style pizza is made in a corner of the Brewpourium, which can seat more than 100 people. "New Haven-style pizza is a cross between New England-style and Neapolitan style," Kassling said. "We believe we are the most authentic New Haven-style pizza place in the country outside of New Haven." The pie crusts are crisp but not as thin as Neapolitan-style pizzas. They are not overladen with sauce, either. There are eight pizzas on the Brewpourium's menu, including a traditional tomato pizza topped with crushed tomatoes, pecorino cheese and extra virgin olive oil. More exotic fare includes a white clam pie, which includes clams, Parmesan, garlic, parsley, extra virgin olive oil, pecorino and oregano. "The reason (New Haven-style pizza) fits our brand so well is that William Howard Taft went to Yale, which is in New Haven," Kassling said. The new location contrasts with Taft's Ale House, which Kassling and Williams opened in April 2015 at the corner of 15th and Race streets in Over-the-Rhine. The ale house, located inside an old church, will continue to sell its more gastropub-style food and core beers. 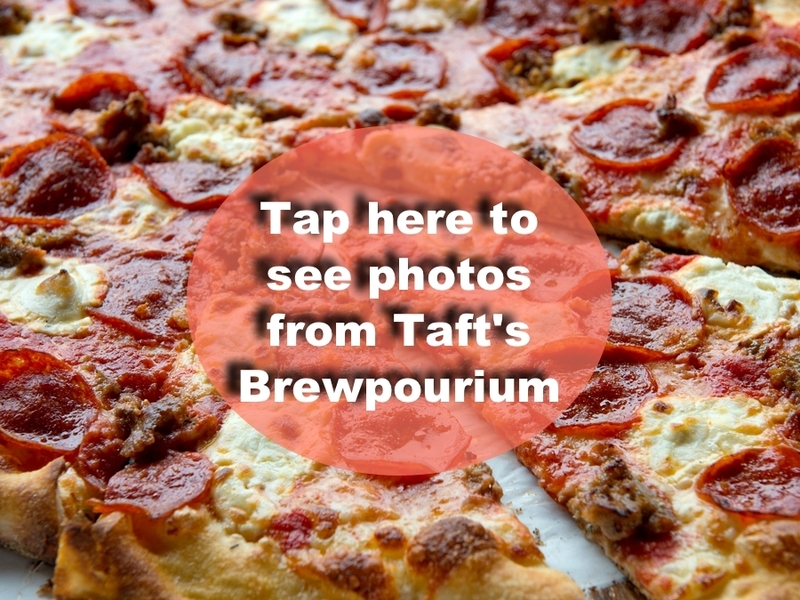 Taft's will offer a free shuttle service from the ale house to the Brewpourium on Saturday. Williams said the new state-of-the-art production facility is currently on target to produce 15,000 barrels of Taft's beer per year. Its maximum capacity is about 100,000 barrels, according to the owners. Taft's plans to start distributing its beers to Boone, Kenton and Campbell counties in Northern Kentucky for the first time in the next few weeks. Kassling said visitors to the Brewpourium also can expect to see new, more experimental beers on tap in the coming months. "Then we are going to have a lot of familiar beers as well," he said. Taft's Brewing Company "Grand Opener"
4831 Spring Grove Ave., Spring Grove Village. Golden ticket prizes include a Yeti cooler, giant Jenga games and one grand prize of a free large pizza every week for a year served at the new taproom. For more information visit the event Facebook page.